Professor David Hulme, ESID’s CEO, introduces this new edition of Governance, Management and Development: Making the State Work. He outlines how the debates have changed and sums up the four key themes of the book. The last 25 years have seen the most rapid economic growth and the biggest increases in life expectancy in human history. Still, between 1.5 billion and 3 billion people live in poverty and at least one-third of the world’s countries are classed as fragile or very badly governed. The first edition of Governance, Management and Development rolled off the press in 1997, when policy debates about governance and discussions about the future of non-governmental organsations in development were in their infancy. Privatisation was de rigueur for the World Bank and IMF, while public-private partnerships were novel arrangements in developing countries. At that time, my co-authors and I had deep concerns about the newly dominant policy agenda, which focused on minimising the role of the public sector, rolling back the state until it almost disappeared, while naively waving the new banner of ‘good government’ for all to cheer. Since 1997, much has happened. The environments in which the organisations of developing countries operate have been true to the form described in the first edition – turbulent and uncertain. There have been many changes in policies and prescriptions, although some ideas have held fast. Also, there have been profound changes in the geopolitical and economic landscape, such as the rise of China and the other BRICs, increased globalisation, more democratisation and more wars and civil conflicts. Metaphors which liken organisations to machines can be extremely misleading, as they suggest that changing a spark plug or adding a transformer are somehow equivalent to adopting a new management strategy or re-orienting staff development and training. Management systems, administrative techniques and organisational designs are not neutral, value-free phenomena. Thus, administrative reform and innovation are not simply a matter of installing some piece of managerial technology which has proved effective elsewhere. There are no universal principles of management and no universal management tool kits. Although the air-conditioned, high-rise accommodation of public service agencies in some developing countries may appear to divorce them from society, organisations are not closed technical systems. They are necessarily involved in multiple relationships with other organisations and individuals. Complex webs of relationships are thus woven between these actors and have profound effects on the operation of organisations. There are also social and economic forces which impact on organisational activity. For example, declining exchange rates and falling commodity prices will mean reduced government income and will exert severe pressure on public service budgets. National culture may be a key determinant of the way in which activities are conducted and may influence operational norms and practices as much as the public service manual of procedures. And the influence is unlikely to be one way. Organisations are not simply acted upon, but can also influence their environments. The whole purpose of development, and organisations that are there to promote it, is in fact to alter environments in ways that are beneficial to citizens and/or target populations. Organisational action takes place in political contexts. Power and authority permeate relationships between organisational members and between these persons and those in the external environment. The range of patterns and possibilities is enormous and is reflected in a wide diversity of practice. Technical rationality will frequently be a poor guide to decisions and behaviour. The explanations of particular policy choices, planning decisions, implementation successes and failures, and unlearned lessons of evaluation will be found in political analysis. If, for example, we wish to comprehend why rural organisations for the poor have often failed, we need to understand the political landscape in which those organisations attempt to operate. Society, state and business are enmeshed in political relationships. Competition over resource control and allocation is ubiquitous and for the analyst, practitioner and potential beneficiary alike, the map of power and authority is an essential guide, more useful than the latest scientific planning tool. Development is multi-faceted, and success or failure is based on more than organisational design, administrative reform or human resource management. Such items have a strong bearing on whether developmental progress will occur, but they are never the sole determinants. As Schaffer observed more than four decades ago, ‘The whole lesson is that development administration works only in conjunction with other factors of change’. Furthermore, public sector organisations can be utilised to oppress or to defend the privileges of certain classes and groups in society. They are not innately benign, but must be directed towards the attainment of developmental goals. There is no ‘one best way’ to make the state work. Rather, experience has provided us with a variety of organisational forms, practices and local applications. What has been successful in one place may be inappropriate in another and the lessons of one country’s reforms may be different for the various observers. As time passes, new problems emerge, such as adapting to climate change, dealing with ageing populations, widening economic inequality, or megacity growth. These require new solutions or updated versions of old ones. Public sector organisations will be expected to take leading roles in addressing the emerging problems and to be innovative and resourceful. As has already increasingly happened, the public sector will need to engage in partnerships with the private sector, civil society organisations, other governments and aid agencies. It is critical that we do not think of politics as a malevolent force, but rather as a normal state of affairs. It is through political institutions and processes that decisions are made and implemented. The principal task for development management is how to ensure, along with other sympathetic actors, that the poor and marginalised are not only taken into account, but that their voices are heard and acknowledged, and that they can take control of important decisions that affect their lives. 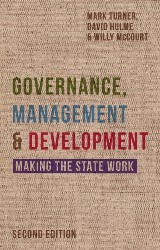 Mark Turner, David Hulme and Willy McCourt (July 2015), Governance, Management and Development: Making the State Work, 2nd Edition. Palgrave Macmillan, ISBN 9781137532459.